The Xiaomi Redmi Note 3 sports an all metal body and has rounded edges along the sides. Turn around the phone and the resemblance to the rear side on the Meizu MX5 is uncanny. The round fingerprint scanner is located just below the 16MP camera on the rear side and they are aligned to be placed in the centre. The dual LED flash unit is located in between the camera and the fingerprint scanner. The base has the speaker section and there’s a slight protrusion chin just below to ensure there is a gap between speaker section and the flat surface its placed on. Looking around the device, on the left hand edge you have the dual SIM card slots, at the base there is a microUSB charging and data transfer port, on the right hand edge you have the volume rocker and power standby buttons. The top edge has the 3.5mm audio jack and an infrared blaster for controlling IR home appliances. The front has a 5.5inch display which has a tendency to collect smudges. Thanks to the sand blasted matte finish on the rear side, you get a good grip on the phone. One handed option is inconvenient.The in hand feel of the phone is good as there are no sharp edges around the phone. Everything is nicely rounded. There’s even a chrome strip running around the edges which is slightly raised, so that it helps the display from touching the table if it is placed face down. Now these are minor touches, but quite thoughtful. Even the volume rocker and power/standby buttons are metallic with chamfered edges and a good feedback. At 8.7mm thickness and 164 grams in weight, it is not winning any prizes in the slimness and lightness departments, but it isn’t bad at all considering it houses a 4050mAh battery. 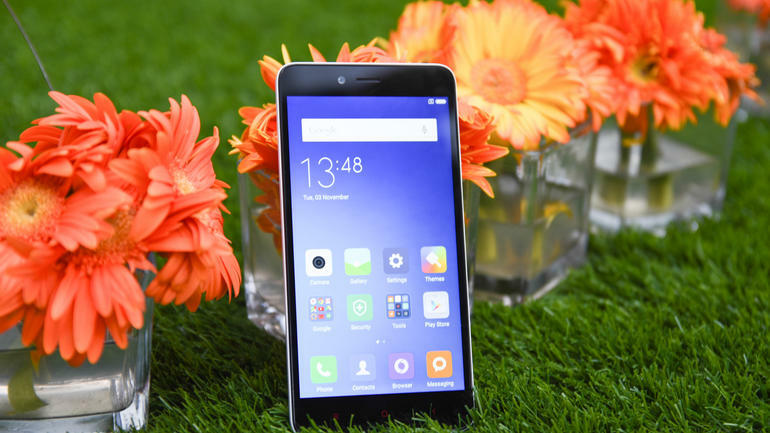 Xiaomi is one company which started the specs vs price battle when it had launched the Mi 3 two years ago. And that is a legacy it has carried forward with the Redmi Note 3 as well. For starters, the Redmi Note 3 comes with Qualcomm Snapdragon 650 SoC which houses a hexa core processor, with a dual core Cortex A72 processor clocked at 1.8GHz and a quad-core Cortex A53 processor clocked at 1.4GHz. This is paired with Adreno 510 GPU. There are two variants on the Redmi Note 3 – one comes with 2GB RAM and 16GB ROM and the other comes with 3GB RAM and 32GB ROM. We got the latter for testing and Xiaomi has given you the option to add in a microSD card to expand the storage. Out of the 32GB storage, the user available space is around 26.28GB. It runs Android 5.1 OS with MIUI 7 skin atop it. We will discuss more about MIUI 7 in the software section. On the camera front, you have a 16MP rear camera with an aperture of f/2.0 and a 5MP front facing camera. The Redmi Note 3 comes with a hybrid dual SIM Card slot and can take in two 4G SIM cards which are hot-swappable. It supports voice over LTE (VoLTE), Wi-fi 802.11 b/g/n/ac, Bluetooth 4.2 LE, FM radio, infrared port, GPS with AGPS and so on. 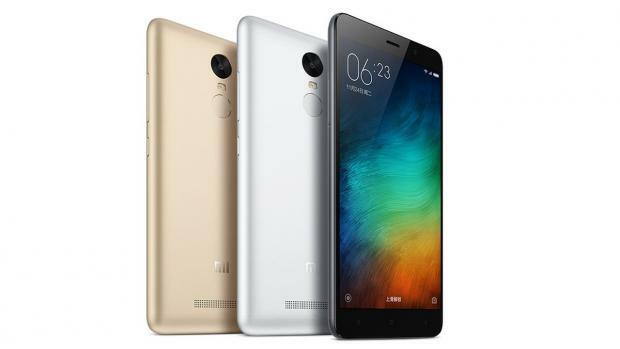 The Redmi Note 3 is the first Xiaomi phone to sport a fingerprint scanner as well. The Xiaomi Redmi Note 3 sports a 5.5inch fullHD IPS LCD display which gives it a pixel density of 401ppi. The colours look natural and it has a good viewing angles. But the display tends to collect smudges which though easily removable are still annoying to have. There is no Corning Gorilla Glass protection, but the display is scratch resistant. 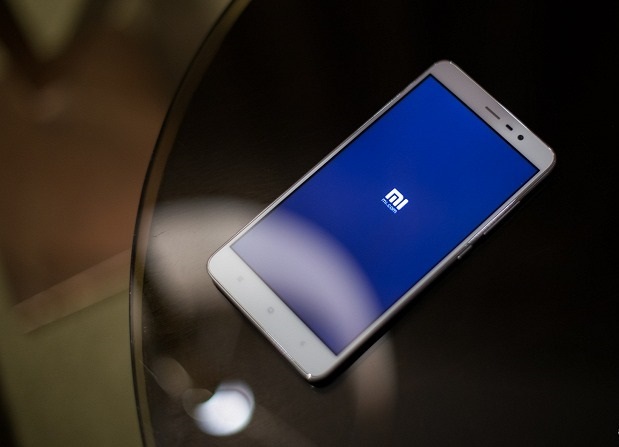 Xiaomi has carried forward the Sunlight Display technology from its Mi4/Mi4i line onto the Redmi Note 3. For those not aware, the Sunlight Display makes adjustments to the display at a pixel level so that you see a balanced image in bright outdoors. This is on by default and works when you are out in bright sunlight and want to photograph, without having to shade your phone. Reading mode helps reduce the blue light being emitted to reduce the eye fatigue, by adding a yellow tinge to the display. The IPS LCD display is quite good with a good contrast ratio and decent black levels. Viewing angles are great, although the display can get very reflective at times. 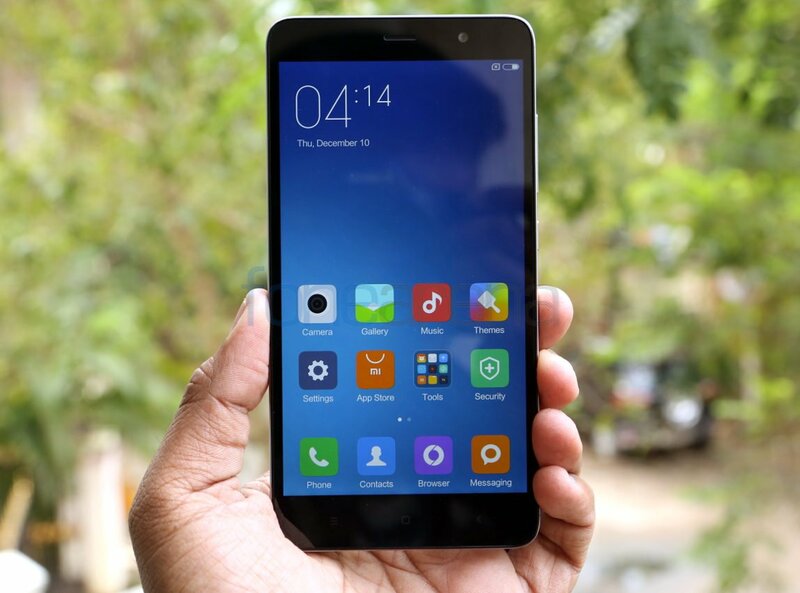 MIUI 7 OS which was announced by Xiaomi in October last year comes loaded on the phone. 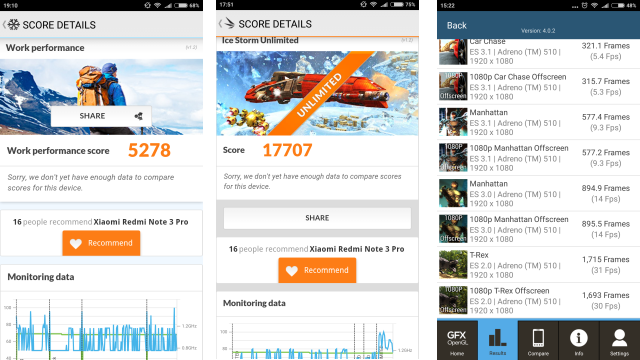 While in terms of pure looks, there isn’t any drastic difference from the MIUI 6, but we do see some finesse on the OS. 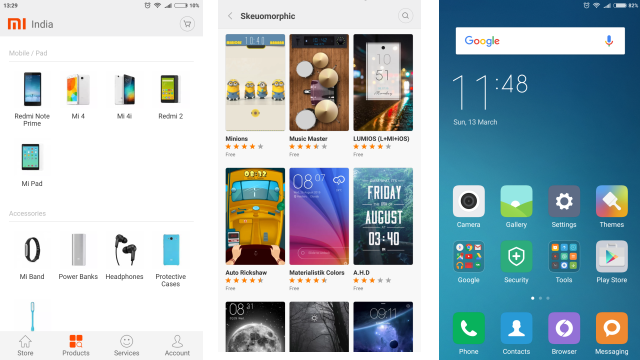 Xiaomi has added on a lot more Indian themes to the MIUI 7 for starters. It has an animated profile picture feature called ‘Showtime’ which lets other MIUI users see your animated selfies when you call them, instead of a profile picture. In the messaging app, MIUI 7 divides messages from your contacts and services. An interesting touch is that if you are getting a one-time password (OTP) for some or the other credentials fulfillment online, you now get the option of copying the OTP from the notification itself rather than opening the message to search for. This is a good addition as you do not need to switch between screens. Same goes for calls – you get floating notifications at the top. Xiaomi has also bundled in two months of free Hungama digital streaming for Redmi Note 3 buyers. Apart from the 13 system apps you also get a additional apps such as Flesky, WPS Office, Facebook, SwiftKey which thankfully dosen’t seem like a lot. You also get the Mi Store app pre-installed in case you want to purchase anything from the Mi India store. You can enter into the one handed mode in case you find the 5.5-inch screen size too much. You get the option to select between 3.5-inch, 4.0-inch and 4.5-inch screen sizes. You can also select photos from your gallery and add them to a hidden albums. Call quality on the Redmi Note 3 is excellent and the earpiece speaker is sufficiently loud even outdoors. We didn’t face any issues with signal reception even inside elevators, that’s speaking a lot. Qualcomm Snapdragon 650 chipset is quite impressive here. 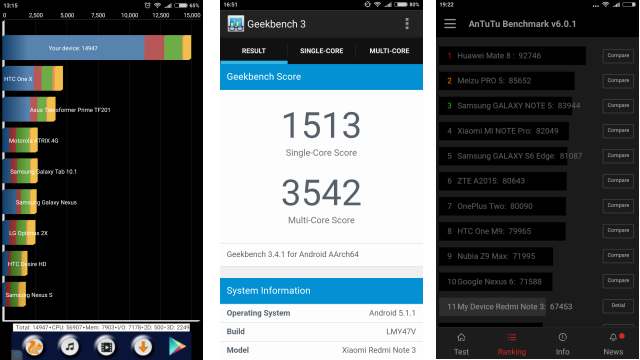 It is clearly performing at par with Qualcomm’s last generation hex-core Snapdragon 808. Phones around the Rs 20,000 price point house this processor. The Adreno 510GPU ensures a smooth performance while gaming as well – Asphalt 8: Airborne is playable at Extreme settings as well. All in all, the Redmi Note 3 excels in the performance department when compared with competition in this price range. Despite the MIUI 7 skin atop the Android 5.1OS, we did not face any slowdown issues with the Redmi Note 3, which is interesting since the Mi4i did show a lot of lag in this department. The phone does take ages to reboot after a system update though, so beware in case you are in the middle of an important conversation, finish it off before you hit Reboot for the new system updates to take effect. Heat management is quite good and unlike the the Mi4 and Mi4i, the phone does not heat up noticeably while playing heavy games, despite having a metal body. Fingerprint scanner works fine and is quick. We rarely had to keep adjusting the finger position for the scanner to unlock. You can also use the fingerprint scanner to click photographs or even lock apps, which is an interesting feature. Audio output isn’t that loud and you really have to cover the rear side to hear it clearly. 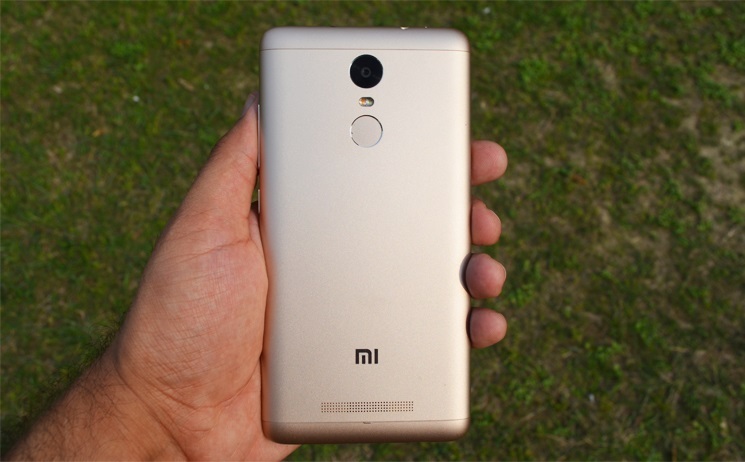 Xiaomi Redmi Note 3 sports a 16MP rear camera and a 5MP front-facing camera. The rear camera comes with phase-detect auto-focus function which works great in well lit situations, but struggles in low light. Xiaomi has added on the timelapse and slow motion feature for video shooting as well along with a fullHD video recording support. Image quality for daylight photographs is quite good. The HDR mode on the camera is similar to the one we had seen with the Mi4i, and is able to give a balanced output for regions in the shadow area. But we noticed that the highlights did get blown out on a lot of occasions. The Sunlight display feature which worked wonderfully when using the Mi4i, is quite slow on the Redmi Note 3. There were many instances when we had to literally wait a couple of seconds before the camera kicked in Sunlight display. Low light photography is the Achilles heel of the Redmi Note 3. The camera just refuses to give sharp images. It takes time to lock on focus and if you are in the HDR mode, then unless you have rock steady hands, forget getting a remotely sharp image. The performance is quite reminiscent of the one we had seen with OnePlus X – good daylight photographs, but mediocre low light shots. The bump in the megapixel count clearly shows its shortcomings in the low light department. The Redmi Note 3 comes with a 4050mAh non-removable Li-Polymer battery. 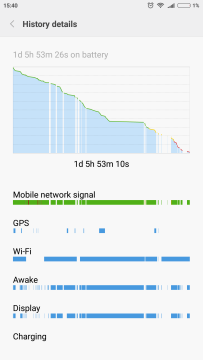 It manages to retain the battery life really well. We were impressed with the battery life on the phone since we could easily go over a day and more, with a single charge, despite using the phone to watch videos, update social apps and listen to music for hours. If you want to still extend the battery life further, you get some Battery saver modes as well. One thing we would have really liked to see is a Marshmallow OS support, instead of the dated Android 5.1. 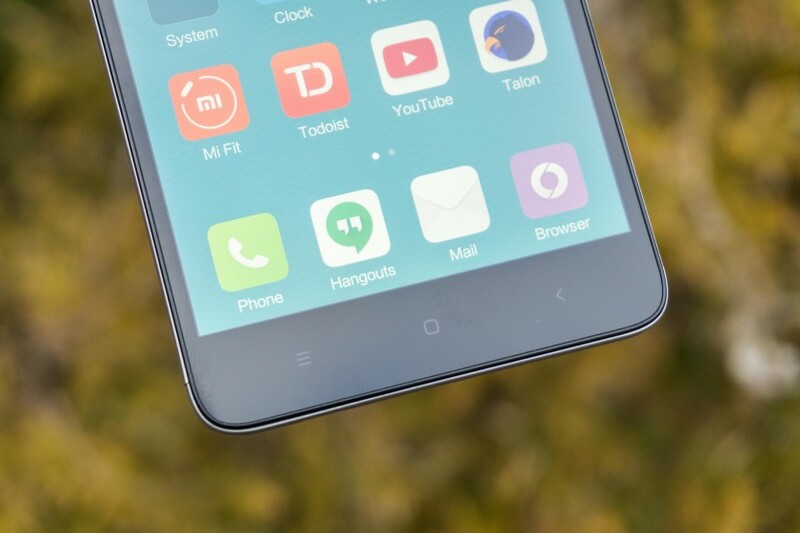 But considering the Redmi Note 3 ships with the MIUI 7, we are not sure when and if the Redmi Note 3 will get an Android 6.0 facelift. Not that the current implementation is bad in any way, but with Android 6.0 features like Doze mode can be great value adds to the already good battery life on the Redmi Note 3. The Xiaomi Redmi Note 3’s closest competition is the LeEco Le 1s which is selling for Rs 10,999 and houses MediaTek Helio X10 processor with 3GB RAM and 32GB storage. We had faced call quality issues with the Le 1s, which is non existent in the Redmi Note 3. Also in terms of pure performance, the Snapdragon 650 goes ahead of Helio X10 by a significant amount. 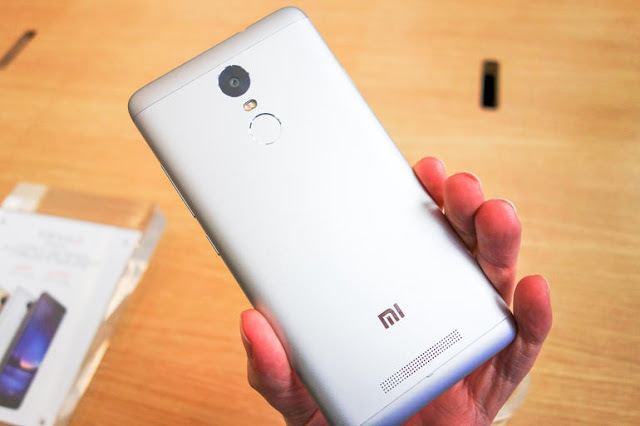 Redmi Note 3 will surely ruin Le 1s’s party with its offering. Great post you have shared here on Xiaomi Redmi Note 3 review:: The smartphone performs in every department, except with low light photography. 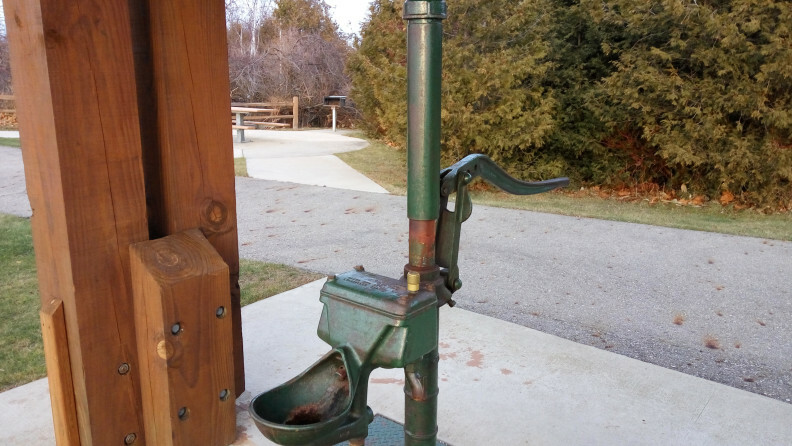 I read your post in detail and got very required information. Thanks for your nice sharing.